Sally Anne Minty-Gravett, M.B.E. 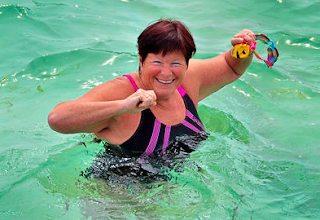 continues to receive honors for her remarkably consistent channel swimming career. Her first award was as an 18-year-old teenager when she won the 1975 Centenary Cup Award from the Channel Swimming Association for being the Fastest Swim of the Year by a British Person across the English Channel. Her latest honor is the Churchill Award for Courage for her two-way crossing of the English Channel in 36 hours 26 minutes at the age of 59. Minty-Gravett is the fifth recipient of the award which was started in 1965 and represents Jersey's highest award for courage. The Award was established by an Act of the States for acts of bravery performed by members of the uniformed services or by members of the public. In the context of the award, bravery is deemed to include acts of endurance and perseverance. The Member of the British Empire (2016) and International Marathon Swimming Hall of Fame inductee (2005) received the award at a reception hosted by the Bailiff of Jersey. "Sally’s achievement is commendable and demonstrates the true meaning of courage. The Churchill Award acknowledges Sally’s commitment and perseverance not only for completing this formidable challenge, but recognises it is an achievement which follows five decades of Channel swims, a tremendous achievement. This award rightly acknowledges personal efforts and continues to demonstrate that the Island has a number of adventurers, who are prepared to go that extra distance both physically and mentally," commended Sir Philip Bailhache, Bailiff of Jersey. Other open water swimmers have also received the award: Denize Le Pennec (1966), Eric Blakeley, M.B.E. (1997), and Wendy Trehiou (2013).